Ecological systems thinking is indispensable in order to build a sustainable society, and fostering an ecological worldview should begin from birth. However, learning about ecology in formal schooling is often superficial and insufficient. For example, in Japan, the content related to ecology appears first in the national curriculum only at the third grade (aged 8 years) of primary school, and for younger children there are no clear descriptions of ecological concepts in the national early childhood curriculum. As a result, early childhood teachers in Japan have little concern with providing opportunities for children to experience activities related to an understanding of ecology. On the other hand, early childhood education has recognized the significance of nature-based activities for young children’s development since Froebel in the early nineteenth century. Early childhood education in Japan has been strongly influenced by this traditional pedagogy, and Japanese educators have practiced nature-based activities, such as gardening and caring for animals, since this time. Recently, interest in education for sustainability (EfS) has increased within early childhood education and has reemphasized the importance of nature-based learning activities. The question now asked is, “How can we distinguish nature-based activities for the purposes of EfS, which constructs an ecological worldview, from the traditional nature-based activities in early childhood education that have been in use since the nineteenth century?” To answer this question, this chapter demonstrates through three vignettes how toddlers and young children might begin to realize the relationships between animals and the natural environment and their own connectedness to the natural world in a Japanese early childhood education and care center. The potential of learning from traditional primary industries or indigenous cultures and the importance of transforming the educator’s lens in order to foster an ecological worldview about nature-based activities in early childhood are also considered. Human population grew four-fold, and global fossil fuel consumption increased by 15 times during the 100 years of the twentieth century (Ritchie & Roser, 2017; Roser & Ortiz-Ospina, 2018). These characteristics of the Anthropocene epoch have caused numerous and complicated environmental issues (Steffen, Crutzen, & McNeill, 2007). Human society has recognized the importance of protecting our shared environment resulting in many governments having environmental policies, Environmental Education (EE) in schools in some countries, and many industries have listed environmental protection as their corporate social responsibility since the 1970s. For example, alerts about global warming started in the early 1970s; the international convention against climate change was concluded in 1992; many governments made management policies to reduce CO2 emissions under the Kyoto protocol (1997), and the Paris agreement (2015) will demand further policy changes in each government; and textbooks for schools began describing global warming (e.g., Choi, Niyogi, Shepardson, & Charusombat, 2010; Koro, Nasu, & Kita, 2005). However, we are still confronted with climate change and environmental crises caused by global warming. This reality implies that existing strategies have not had enough effect in preventing the progression of environmental crises. Therefore, it is important to reflect on existing strategies and find new ways to change the world. This chapter reflects on how the long history of existing nature-based education in Japan has lacked a focus on learning about ecology and ecological systems. I use the term “traditional nature-based activities” to describe the pedagogy for existing nature-based education such as caring for animals, gardening, and outdoor play, which have been practiced in Japanese early childhood education settings since the nineteenth century. Then this chapter also introduces a new pedagogy for Japanese early childhood education to foster an ecological worldview, a view that is seen as indispensable to creating a sustainable society. As one of the fields in biological sciences, ecology has had a long history. The term “ecology” was first named by Haeckel, a German biologist, in 1869, and ecology became one area of biological science in the early twentieth century (Worster, 1985). In this chapter, the terms “ecology,” “ecological,” “ecological systems,” and “ecologist” are used in the sense of biological ecology, in contrast to discussions involving socio-ecological theory in social science or ecologism as a political ideology (e.g., Bronfenbrenner, 1979). The ecosystem concept, which was proposed by Tansley in 1935, describes living organisms and inorganic components interconnected with one another in a complicated network. The interconnected ecosystems that make up the Earth’s ecosystem are not static; rather, they are dynamic, as they are always changing and moving. Human beings are also one of the components of the Earth’s ecosystem. In the history of life on Earth, some organisms such as cyanobacteria radically changed the Earth’s geology and ecosystems, but these changes took place over two or three billion years (Canfield, 2014). However, the speed of human-caused impacts now is extremely high – there has been no similarly rapid change evident in the Earth’s history (Ceballos et al., 2015). Many scientists have termed the present world as “the Anthropocene,” an epoch noted for human impact on the Earth’s geology and ecosystems (Braje, 2015; Lewis & Maslin, 2015; Waters et al., 2016). In the Earth’s history, there have been five mass extinctions of multiple species (Elewa, 2010), and many biologists have warned that we are now in the era of the sixth mass extinction (Kolbert, 2015). Although the causes of the past five mass extinctions are not scientifically clarified, it seems that there was a catastrophe that destroyed the environment and led to the mass extinctions (Benton, 2005). These previous mass extinctions present a warning to current human populations that a dramatic environmental change, such as we are experiencing with climate change, may be a catastrophe that could impact on the Earth’s ecosystem and therefore our human species survival (Ripple et al., 2017; Scheffer, Carptenter, Foley, Folke, & Walker, 2001). Recently, the contemporary ecologist Schmitz (2016) describes the role of ecosystems in an ethos of sustainability: “from an ecological standpoint, sustainability means that ecosystems have the enduring capacity to be productive” (p. 4). This requires a holistic approach to ecosystem health as even nondominant species, which may not appear to have a significant role in the ecosystem, have been found to be important elements in maintaining the whole ecosystem (Schmitz, 2016). While the concept of sustainability is usually described as being equally divided into economic, social, and environmental (ecological) perspectives, the former two perspectives are impossible to achieve without ecological sustainability as our human systems would not be possible without the basis of human survival – Earth’s ecosystems. Thus, it is necessary to maintain the Earth’s present ecosystem (with its subsystems) and to regard this planetary ecosystem, not as a natural resource just for the human economy, but as a dynamic system for all life, including humans. As the Earth is considered a dynamic ecosystem, then humans (including children) and nature are one (childhoodnature) interrelated with all nonhuman others in the Earth’s ecosystem; thus, the notion of the separation of humans and nature must be rejected. But as Schmitz highlights, “societies still tend to hold the worldview that humanly based and nature-based systems are largely independent entities” (Schmitz, 2016, p. 131). The perspective of childhoodnature where humans are recognized as nature and members of the Earth’s ecosystem is not shared by everyone and is generally ignored in social or economic activities, as is illustrated in the following section which looks at ecology in education in Japan. In Japan, ecology as a subject is included in the national curriculum and ecological concepts – such as the relationship between organisms and their surrounding environment – first appear in the “science” learning area in third grade of primary schools (aged 8 years). The predator-prey relationships are included at sixth grade of primary school in Japan (aged 11 years) and students learn concepts, such as ecosystem, food chain/webs, producers, consumers, and decomposers in lower secondary school. Therefore, students of primary and lower secondary schools, which constitute the compulsory education levels in Japan, learn about those ecological concepts described in the national curriculum at age eight to fourteen. However, learning about ecosystems in Japanese schools does not seem to include the role of humans, and ecosystems are presented as static entities. As a result, even university students often report that they have never thought of humans being part of ecosystems or as one of the consumers whose lives interconnect with those of the producers and decomposers (other organisms on Earth) (Inoue, 2005). This implies that learning ecology in Japanese schools has given students superficial textbook knowledge, which does not influence their thoughts and behaviors in terms of environmental concerns. Research in EE or environmental psychology has also revealed that although people may have concern and knowledge about environmental issues, those concerns and knowledge do not necessarily influence people’s behaviors (e.g., Bamberg, 2003: Liefländer & Bogner, 2016). It seems that, for most people, environmental issues exist in a separate world and that ecosystem issues are not their problems, but rather other people’s problems. In order to understand the significance of humans being part of the Earth’s dynamic ecosystem and that human activities impact on this system, it is important to develop an ecological worldview. The concept “worldview” emerged in German philosophy in the nineteenth century, and since then, it has been given various meanings; therefore, this concept is often complicated and confusing. Worldview in this chapter uses the concept based on the simple and standard dictionary meaning, that is, “conception of the world,” which has been described as a holistic framework of both cognitive and noncognitive factors such as knowledge, beliefs, values, and emotions (Koltko-Rivera, 2004; Naugle, 2002). As worldviews are constructed through the influence of cognitive and non-cognitive factors, a person’s worldview can be developed through life and so is individually and culturally acquired. An ecological worldview has been described in some literature as referring to environmentally responsible behaviors (e.g., Blaikie, 1992). For the purpose of this chapter, however, an ecological worldview is simply defined as a worldview based on ecology, which regards human beings as one component of the Earth’s ecosystem. This approach is aligned with that of Goldsmith (1988) and Krebs (2008); Krebs is a contemporary ecologist, who uses the phrase ecological worldview in contrast to an “economic worldview.” People watch, explain, and interact with the world based on their worldview. An ecological worldview is, therefore, more than knowledge of ecological concepts or love of nature; it is a way of being in the world. We can find examples of an ecological worldview in many indigenous societies such as the Aboriginal Australians and the First Nations in Canada. Traditionally, indigenous people in many countries lived guided by their ecological worldviews (Breidlid, 2012; Pierotti, 2012). These indigenous ecological worldviews, including traditional indigenous knowledge, have been transmitted from generation to generation by informal education in the community (Berkes, Colding, & Folke, 2000). Therefore, a philosophy of ecology as the basis of life was embedded in all aspects of their ordinary lives. How then might people who live in the contemporary urbanized world develop their ecological worldviews? Why Should Education for Sustainability Start in Early Childhood? The rapid economic growth after the Second World War changed the local ecosystems and created many environmental issues in developed countries (Meadows, Meadows, Randers, & Behrens, 1972). Subsequently, those environmental issues, such as climate change caused by global warming, desertification, and ozone depletion, have become more widespread globally (Meadows, Randers, & Meadows, 2012). In the 1970s people began to be aware of the relationship between human activity and the changes in the environment (e.g., United Nations Conference on the Human Environment in 1972), and it was then that EE was first recognized. In the early 1980s, the concept “Sustainable Development (SD)” was articulated (International Union for Conservation of Nature and Natural Resources [IUCN], 1980), and in the 2000s, Education for Sustainable Development (ESD) was internationally recognized after the Johannesburg Summit in 2002 (United Nations Educational, Scientific and Cultural Organization [UNESCO], 2014). As a result, the United Nations launched the United Nations Decade of Education for Sustainable Development (UNDESD) initiative from 2005 to 2014. Extending on this history, Education for Sustainability (EfS) emerged as an important educational theme in the twenty-first century for building a sustainable society, although the background history and relationship among these concepts are complicated and confusing (e.g., Bonnett, 2002; Fien & Tilbury, 2002; Hopkins & McKeown, 2002). EE emerged in the 1970s, and academic research has been conducted since then; however, early childhood EE research literature has been rare until recently to such an extent that articles have only been found after the 1990s, firstly led by Wilson in the United States and then by Davis and Elliott in Australia (Davis, 2009; New South Wales Environmental Protection Agency [NSWEPA], 2003). In the 2010s, research concerning early childhood EfS/ESD increased (Cutter-Mackenzie, Edwards, Moore, & Boyd, 2014; Davis & Elliott, 2014; Huggins & Evans, 2017; Siraj-Blatchford, Mogharreban, & Park, 2016). Recent research on infants’ and young children’s development strongly supports starting EE/ESD/EfS in early childhood (Samuelsson, 2011). Soon after birth, infants show sympathy with other humans, and this emotion develops through further experiences in human relationships (e.g., Eisenberg, Spinrad, & Sadovsky, 2006; Gopnik, 2010; Spinrad et al., 1999). Even new-borns are distressed after another infant begins to cry (Dondi, Simion, & Caltran, 1999). Then, after sympathy, empathy develops. The development of empathy could influence a sense of social justice in the future (Hoffman, 2001). Sympathy and empathy seem to be inherent characteristics of human beings gained by evolutionary process (Boehm, 2012); however, these emotions need to be fostered and developed through experiences. Sympathy can influence children’s prosocial behavior (Malti, Gummerum, Keller, & Buchmann, 2009). A longitudinal study by Eisenberg et al. (1999) reveals that the emergence of a prosocial personality in early childhood is consistent over time. If sympathy with nonhuman nature (animals, plants, and other organisms) is fostered in early childhood, it may be possible to develop empathy toward nonhuman others, which then evolves into a sense of social justice with environmental matters. Many studies report that nature-based experiences in childhood correlate with future environmental behaviors and thinking (e.g. Chawla, 1998; Hosaka, Sugimoto, & Numata, 2017; Prévot, Clayton, & Mathevet, 2016). To further reinforce the importance of sustainability/ecological learning in early years education, especially after the United Nations Convention on the Rights of the Child (1989), young children are increasingly regarded as active agents with a right to participate in society and in matters of concern to them. Even young children have many opportunities to recognize environmental issues and their causes – recent research in EfS for young children has shown high interest in this agentic perspective with studies revealing that even young children can act to promote sustainability (Davis, 2008, 2014; Mackey, 2012). Promoting sustainability in early childhood education includes children’s active participation and also critical thinking (Somerville & Williams, 2015). However, I contend that people who critically think and actively participate in the world based purely on an “economic worldview” may not be able to comprehend the true meaning of sustainability. People with an “economic worldview” regard the Earth as a natural resource just for human use and give priority to economic growth. An economic worldview approach may include critical thinking and active participation regarding protection of natural resources, but this is primarily for the purpose of economic use, for sustainable economic growth. Such economic sustainability thinking and participation appear to be appropriate for EE/EfS at first glance. Critical thinking and active participation are important for EE/EfS indeed; however, these views should be fostered based on an ecological worldview, not on an economic worldview, to build a sustainable human society. Furthermore, it is recommended to start education for social justice as early as possible because children already have biases by the age of two (e.g., gender, ethnicity, and disability), and it is more difficult to change these biases after they reach their teens (Bussey & Bandura, 1999; Sparks, 1994). Many studies have revealed the existence of social stereotyping and prejudice by the age of four (Brown & Bigler, 2005), and salient social groups seemed to influence their developmental processes (Bigler & Liben, 2006). At age five, children in different cultures already show different prosocial behaviors and emotional reactions to the same experimental situation (Trommsdorff, Friedlmeier, & Mayer, 2007). These studies imply that even a toddler has already been influenced by the values of people, community, and society that surround her/him. This is also explained by Bronfenbrenner’s child development theory (Bronfenbrenner, 1979), which focuses on the influences of quality and context of the child’s environment. Social biases are developed by various factors in multiple levels, such as families, peers, or teachers (Bronfenbrenner’s “microsystem”), the social media (“exosystem”), and cultural values (“macrosystem”). The fact that a child can be affected by the social values of their surrounding social environment at an early age could also apply to biases towards positioning children and nature. These biases could include children being considered as separate to or superior to nature and to natural systems, in contrast to the childhoodnature perspective where children and nature are inseparable, hence the importance of education for social justice in the early years. The latter two concepts are the focus of this chapter. They are not widely recognized as important issues within early childhood education research, although they are supported in the general EE research literature over the last few decades (Gough, 2013; Palmer, 2002). Combining an ecological worldview and empathy with nature concepts, with established early childhood education approaches of critical thinking and children’s active participation, creates possibilities for fostering young children’s interconnections with nature. As has been shown, learning ecology is indispensable for EE/EfS because human beings are a part of the Earth’s ecosystem and cannot survive outside of it. While we have much knowledge of ecology today, from school education and various media sources, this knowledge is separated from our own social and economic lives. It is argued that this human–nature divide can promote a view that ecological matters are not our problem; instead, these are considered the natural world’s problems and exist outside the sphere of human lives. Such a view will prevent the creation of a sustainable society because it is not holistic or systematic and is in contrast to the childhoodnature concept. As noted earlier, indigenous worldviews are often described as “ecological.” So it follows that learning from indigenous cultures has the potential to nurture an ecological worldview. Indigenous ecological worldviews have been fostered through informal education in the indigenous communities and embedded in all phases of indigenous social and economic lives. Sometimes, cultural resources such as ceremonies, rituals, stories, myth, legends, and songs have taken key roles in the development of the ecological worldviews (Cajete, 1993). Although it is difficult to apply indigenous informal education pedagogy into nonindigenous formal education due to dissimilarities in various aspects such as cultural backgrounds, values, and beliefs between them, there are examples of the application of indigenous perspectives among kindergarten teachers in New Zealand and Australia. National curricula in New Zealand and Australia require indigenous perspectives to be included in early childhood education (Department of Education, Employment and Workplace Relations [DEEWR], 2009; Ministry of Education, New Zealand, 1996, 2017), and early childhood services in both countries have started to incorporate the use of indigenous cultural materials and provide opportunities to experience cultural events. Some centers have applied more holistic and whole-center approaches beyond just displaying materials or experiencing sporadic events (Duhn & Ritchie, 2014; Lee, 2012; Ritchie, Duhn, Rau, & Craw, 2010). The teachers cooperate with indigenous people in local communities in order to incorporate resources such as traditional knowledge, stories, and legends. As a result, local indigenous practices and ecological worldviews, such as respect for the land, have started to influence early childhood practice including activities for sustainability (Jacobs, Bursill, Lee, & Morgan, 2013); this seems to contribute to the development of children’s ecological worldviews. Nevertheless, there is evidence that many countries have lost or are at risk of losing their indigenous cultures with the disappearance of informal indigenous education in today’s urbanized world (Johansen, 2003; United Nations, 2009). For example, in Japan the indigenous group of people, the Ainu, have lived for a long time in Hokkaido, a northern island of Japan. The Ainu people have been persecuted especially after the nineteenth century, and the Japanese national curriculum has not described the Ainu culture positively or included Ainu traditional knowledge; therefore, learning about the Ainu culture and ways of being is not promoted, especially outside Hokkaido (Ueno, 2014). As an alternative to learning from indigenous cultures, especially where such cultures are declining or absent from the local community, I propose learning from traditional primary industries. Primary industries are part of the economy and they also have caused changes of the Earth environment in the Anthropocene. However, traditional primary industries have been conducted in more sustainable ways than modern ones. For example, in the last two decades, Japanese stakeholders for sustainability have been concerned with a Japanese term, “Satoyama,” which was first used in the eighteenth century and is defined as “secondary woodland and grassland adjacent to human settlements” (Takeuchi, Brown, Washitani, Tsunekawa, & Yokohari, 2003, preface), “traditional forest and agricultural landscape” (Kobori & Primack, 2003, p. 307), or “a mosaic of ecosystems including wetlands, grasslands, woodlands, farmlands, paddy fields, and settlements” (Cetinkaya, 2009, p. 28). In the past, Japanese people who engaged in traditional primary industries had to maintain “Satoyama” (local woodlands and grasslands) to sustain their industries; therefore, “Satoyama” not only provided a variety of natural products for human living but also preserved rich biodiversity. In the process of maintaining “Satoyama,” Japanese people had abundant knowledge about the natural world and how to live with the rest of nature. These traditional primary industries are completely different from modern ones which are dependent on fossil fuels and artificial chemicals; therefore, traditional primary industries can provide a resource to learn about sustainable living. Although “Satoyama” symbolizes a traditional Japanese way of living based on sustainable primary industries, including agriculture, fishery, and forestry, we can still find similar traditional, ecologically sustainable, ways of living internationally (Bélair, Ichikawa, Wong, & Mulongoy, 2010). For example, Garavito-Bermúdez and Lundholm (2017) reported Swedish traditional fishers had stronger place attachment and showed deeper understanding of ecosystem structure and dynamics than nontraditional ones. As an agriculture-based society for over 2000 years, especially rice farming, Japan has many kinds of traditional ceremonies, stories, songs, and folk arts that are specific to each district. These practices often express the human-nature interconnection, which has been transmitted through traditional informal education in the community. Although many traditional practices have been lost with the urbanization and globalization of the twentieth century, our food is still produced by primary industries that are informed by understandings of the natural world and some of traditional knowledge and cultural resources still exist. Therefore, rediscovering and experiencing traditional primary industries could help promote childhoodnature and foster an ecological worldview. As I have shown in order to develop an ecological worldview, children need to understand the concept of ecosystems and how society, economy, and the natural environment are interdependent. However, in modern, urban life in Japan, young children tend to learn from their families about consumer society by going to the shops for food and other necessities; I argue that these experiences foster an economic, not an ecological, worldview. Anecdotal evidence from Japanese early childhood educators suggests that many young children in their care believe their food originates in shops and supermarkets. Similar misconceptions about the origins of food have been identified internationally (e.g., British Nutrition Foundation, 2013; Purvis, 2011). Experience of a modern economy results in a lack of awareness about the fundamental role of the Earth’s geological, hydrological, and biological systems in food production. Components of food production include: soils, rain, water, sunlight, air, pollinating insects, invisible soil biota, energy (often from fossil fuels) for machinery and transportation, and human labor. These processes can be called shadow processes because the processes exist in reality, but the people who buy food at the shops may have no awareness of them (Vileisis, 2010). I argue that it would be helpful to experience traditional primary industries and think about these shadow processes in modernized life in order to promote an ecological worldview. The question then follows: Does early childhood education recognize the importance of fostering an ecological worldview and plan children’s activities such as experiencing primary industries which would lead to an awareness of the ecological systems relating to food production? In the next section, I reflect on activities in the existing Japanese education framework relating to traditional nature-based activities. The pedagogy of early childhood education has a long history of recognizing the significance of traditional nature-based activities. For example, Comenius, in the seventeenth century, believed young children learned about the natural world through their five senses (Comenius, 1962). Froebel, in the nineteenth century, from the Christian perspective, regarded nature-based activities as important because they lead children to understand how and why God made the world for human beings, “the natural world is the presence of direct achievement by God, the first revelation of God” (Froebel, 1972, p. 127). He thought young children become aware of God’s revelation by caring for plants in their own gardens in the kindergarten and that such awareness produces the understanding of themselves as created by God. Therefore, nature-based activities were prioritized in Froebel’s pedagogy. Montessori, in the early twentieth century, also regarded caring for animals and gardening as benefitting the development of young children (Montessori, 1971). Centre-based early childhood education emerged in Europe in the nineteenth century, such as the first infant school established by Owen in 1816 in New Lanark, Scotland, and the first kindergarten by Froebel in 1837 in Bad Blankenburg, Germany. This movement spread worldwide with center-based early childhood education being established in many countries. In particular, Froebel’s pedagogy influenced these movements. In Japan, early childhood pedagogy was imported from European countries after the Meiji government achieved power in 1868, and the first public kindergarten was established in 1876 as an attached school of Tokyo Women’s Teachers College in Tokyo, Japan (the present Ochanomizu Women’s University) (National Institute for Educational Policy Research, 2009; Phillips & Schweisfurth, 2014). Japanese early childhood education was explicitly based on Froebel’s pedagogy in the early days; therefore, the first Japanese kindergartens used Froebel “gifts” (set of play materials) and created children’s gardens in the playground. In 1881, the regulations for the first Japanese kindergarten noted that “outdoor play was most important for young children” and “playgrounds should have trees, flowers, fish, and birds for children’s observation and joyful activities” (Ministry of Education, Japan, 1979, p. 59). The first Japanese national law for kindergartens (the Kindergarten Law) was amended in 1926 to include five learning areas, one of which was “observation” with the requirement that young children should observe their surrounding environment. Since this law was enacted, every following guideline for early childhood education in Japan has emphasized the significance of traditional nature-based activities (Inoue, 2000). 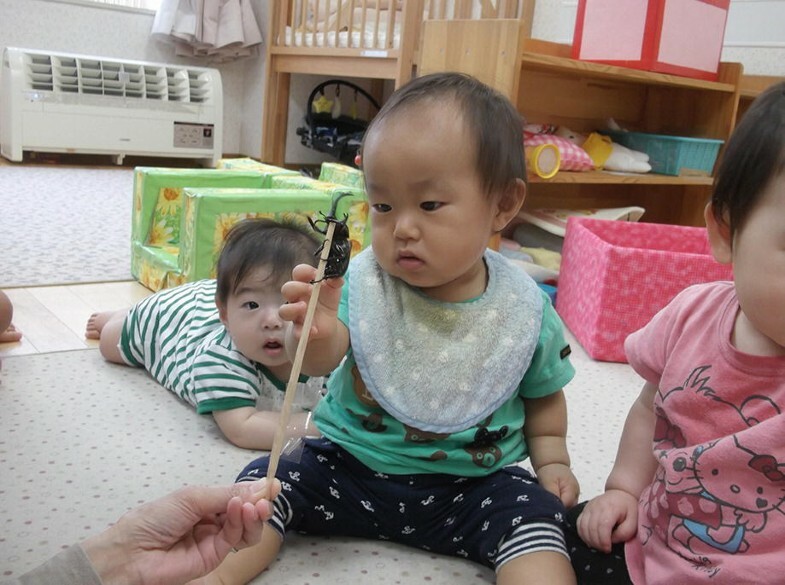 Early childhood education in Japan has had a dual system since the nineteenth century: nursery centers for children of working mothers aged from birth to 5 years old, and kindergartens for children aged 3–5 years as part of the formal school system. In 2006, the Japanese government started a new type of early childhood service called “Centres for Early Childhood Education and Care (CECEC).” Thus, at present, there are three kinds of early childhood services under three different national guidelines; however, fortunately, the early educational curriculum is aligned in these three guidelines. All kindergartens are legally required to have their own outdoor playgrounds, and over 90% of all registered nursery centers and CECEC also have outdoor playgrounds. Then, this poses the question do Japanese early childhood teachers practice traditional nature-based activities as established under the national curriculum guidelines? In 1925, the Japanese Ministry of Education conducted a nationwide survey of kindergartens, which revealed that kindergarten children usually experienced gardening, caring for animals, and excursions to nature spaces in the community. After the Kindergarten Law in 1926, gardening and caring for animals were practiced more frequently (Kurahashi & Shinjyo, 1980). These traditional nature-based activities are still practiced in Japanese early childhood services. For example, I conducted surveys on practices related to traditional nature-based activities in kindergartens and nursery centers three times in 1997, 2004, and 2013. In all the surveys, teachers frequently practiced traditional nature-based activities such as gardening, caring for animals, and outdoor play (Inoue, 2002, 2017; Inoue & Muto, 2006). Thus, Japanese early childhood teachers have understood and been following the national guidelines, and they have continued to practice traditional nature-based activities since the nineteenth century. Traditional nature-based activities in early childhood education are recognized as important in not only Japan but also other countries. The surveys conducted in Australia and Korea by applying the same survey questions between 2012 and 2014 revealed that traditional nature-based activities such as gardening and caring for animals were also well practiced in Australia and Korea (Inoue, O’Gorman, & Davis, 2016; Ji, Huh, Baik, & Chung, 2015). Overall, this is to be expected because, as mentioned earlier, the early childhood education systems and pedagogies in each of these countries were constructed on the theories and practices of pioneers such as Froebel, although there were also influences based on their own cultures and histories. Early childhood centers across the globe have their own playgrounds often with flowers and trees, although the size and quality may vary. Furthermore, these spaces sometimes provide young children with opportunities of traditional nature-based activities. How, then, has the significance of the traditional nature-based activities been conceived throughout the history of Japanese early childhood education? Have they included any reference to ecology, systems thinking, or ecological worldviews? In 1904, the curriculum of one public kindergarten described that gardening and caring for animals fosters awareness of natural laws, instills love, and concern for the natural world and contributes to children’s physical and mental development, whereas outdoor excursions can develop a sense of beauty (Ministry of Education, Japan, 1979). After the Second World War, the Ministry of Education published Nursing Guideline in 1948, which listed 12 categories of preferable activities for young children. One of the categories was “Observation of the natural world”; it was noted that gardening, such as cultivating soils, planting seeds, and watering plants, could develop the love of plants and observation of nature and deepen children’s concern for nature. Such ways of emphasizing the significance of traditional nature-based activities are embedded in the latest national guidelines. The Course of study for Kindergarten (the national curriculum for kindergarten) includes five learning areas, and the descriptions referring to nature (emphasized in bold letters by the author) appear in four learning areas (Table 1). This commitment to traditional nature-based activities aligns with the statements that early theorists and practitioners used in early childhood education, together with more recent research and advocacy. For example, Louv (2006) and Sobel (2008) describe nature experiences as significant for various aspects of child development such as physical and mental health, creativity, concentration, imagination, or environmental stewardship, while Harlan and Rivkin (2010) demonstrate that nature-based learning is necessary for foundational science education. Furthermore, in Japan, there is a view that outdoor play contributes to young children’s physical development (Sugihara et al., 2010; Sugihara, Kondo, Mori, & Yosida, 2006). Ogata, Shimada, and Seki (2013) report that the scores of physical skills were higher than the nation-wide average in children who attended a Japanese forest kindergarten. In environmental psychology, many studies have reported that nature spaces influence humans’ physiological and psychological conditions (e.g., Alcock, White, Wheeler, Fleming, & Depledge, 2013; Mitchell & Popham, 2008; Park et al., 2007; Pretty, Peacock, Sellens, & Griffin, 2005; Ulrich, 1984). While most of the latter studies targeted adults, the evidence suggests that engaging activities in nature spaces also influence children’s mental and physiological health positively. In a review of studies about the relationship between children and animals from the perspective of developmental psychology, Melson (2005) reported that caring for animals has a positive impact on children’s mental health and their development of emotions and responsibility. Recent research on nature-assisted therapy and its contributions to public health provides further evidence for the benefits of nature-based activities (Logan, 2016; Selhub & Logan, 2014; Song, Ikei, & Miyazaki, 2016). 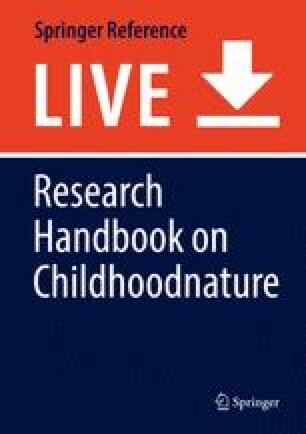 However, when we reflect on the significance of traditional nature-based activities practiced in the long history of early childhood education and the more recent evidence-based research, we cannot find clear descriptions that relate to ecology, systems thinking, or ecological worldviews. Traditional nature-based activities tend to present a more instrumental view of people and nature interactions. Has the recent inclusion of EE/EfS/ESD into the educational setting, shifted nature-based activities in early childhood education to a focus on developing an ecological worldview? In the relatively short research history of early childhood EE, nature-based activities have also been recognized as appropriate practices. For example, one of Wilson’s early works about early childhood EE entitled “Fostering a sense of wonder at the early childhood level” describes the importance of playing in outdoor nature spaces using the five senses (Wilson, 1993). The Early Childhood Environmental Education Programs: Guidelines for Excellence also identifies that “personal perceptions, attitudes, and connections with nature are the key goals at this [early] stage” (North American Environmental Education Association [NAAEE], 2016, p. 3). Furthermore, in Japan, the official Teacher’s handbook for environmental education for kindergartens and primary schools describes similar content and goals (National Institute for Educational Policy Research, 2014). As a result of such learning, does playing in outdoor nature spaces, caring for animals, or gardening foster a sense of wonder and empathy with nature? Furthermore, does or can it contribute to building a sustainable society? Carson (1998) and Cobb (1993), seminal thinkers about the relationship between childhood and nature, describe the value of having a sense of wonder about the natural world, but they do not explain how this links to pro-environmental behaviors; behavior urgently needed now to address our environmental disasters. More contemporary EE, EfS, and ESD activities are targeted towards such behaviors. For EfS or ESD, as an evolved version of EE, nature-based activities in early childhood education have been recommended. For example, OMEP (World Organisation for Early Childhood Education and Care) created an Environmental Rating Scale for Sustainable Development in Early Childhood (ERS-SDEC). To gain a “good” rating in the environmental sustainability section requires that “many resources are available including animals and plants in the setting” (Organisation Mondiale pour l’Education Préscolaire [OMEP], 2015 p. 3). In this scale, animals and plants are regarded as recommended learning resources. However, considering animals as resources represents an anthropocentric view, as it suggests that humans are separate to and have dominion over other animals, and these animals are there for the benefit of humans (children). The scale also refers to recycling, resource conservation, or environmental issues; however, it, too, does not mention about the value of developing ecological systems thinking or ecological worldviews in the early years. Nowadays, much of the current human population live in cities where we cannot find abundant outdoor nature spaces. Until the middle of the twentieth century, more people were engaged in primary industries, which were closer to the natural world, such as agriculture, pasturing, forestry, and fishery. Children of past generations could experience nature-based activities more frequently, and these activities were closer to their ordinary lives. In addition, as previously discussed, children have had opportunities to attend schools or early childhood centers and experienced nature-based activities since the nineteenth century, because the importance of nature-based activities for child development has been recognized in theories of education. However, it is those past generations who have damaged the many ecosystems and have triggered our current environmental crises. We can see this reality, not only in Japan, but across the globe. Reflecting, then, on the application of the theories and nature-based practices of traditional early childhood pedagogy and the daily lives of past generations in the nineteenth and early twentieth centuries, simply experiencing traditional nature-based activities in a kindergarten does not appear to foster widespread ecological systems thinking or ecological worldviews. This suggests that traditional pedagogy, which emphasizes the significance of nature-based activities, has not supported pro-environmental behavior. Nevertheless, experiencing nature-based activities in everyday life is still important because the understanding of ecology and the niche of human beings in the Earth’s ecosystem through direct experiences and interrelating with other natural elements is indispensable. However, I argue that it is not enough to build a sustainable society. As described in the previous overview of the significance of developing an ecological worldview and the lack of fostering such a view in existing education, it is necessary to rethink early childhood education from the viewpoint of fostering an ecological worldview. In this section, I explore three vignettes from one Japanese early childhood service that indicates the possibility that even toddlers and young children can learn ecology. Tomioka-Nishi Centre for Early Childhood Education and Care (CECEC) is located in a residential area of Sakai City (the city next to Osaka City in Japan). This center has developed a “practice study,” which is a form of professional development that is common in Japan, under the theme of EE, and I have supervised the “practice study” since 2010 (Inoue, 2014b). The teachers have improved the learning environment, reflected on children’s activities, and conducted monthly meetings to discuss their practices as a result of their engagement. In this particular practice study, the teachers focus on learning about ecology. I encouraged the teachers to use an ecological lens when they arranged the learning environment, observed children’s activities, and documented children’s learning. The teachers gradually renovated the center’s outdoor playground to increase biodiversity by planting various trees and indigenous grasses. The children and teachers have been composting to learn about ecological cycles and relationships between the everyday lives of human and nonhuman organisms. This center has its own kitchen with a professional nutritionist and kitchen staff who prepare daily handmade lunches and snacks (this is a legal requirement for children aged from 0 to 2 in long day care type centers in Japan). Children take scraps of vegetables or fruits, which were produced in the cooking processes of their lunch and afternoon snacks, to the compost and then observe the compost process. Sometimes, they mix the compost and then use the matured compost soil in the vegetable garden. There are six age groups (0–5) at the center, and the teachers also care for small animals such as snails or insects in all classrooms. The teachers always consider animal welfare with children: some animals caught in the playgrounds are cared for a short while, for observation, and later released; others are brought by families or community people (usually from shops or breeders) and the teachers look after them throughout lives because it is inappropriate to release these animals to disrupt the local populations’ genetics and habitat. Children of all age groups tend to harvest the vegetables in the garden. These vegetables are usually cooked in the center’s kitchen for lunch or afternoon snacks. Sometimes, children over 2 years old assist in the cooking process. Five-year-old children also experience the full process of growing rice (plant seeds, tending to the seedlings, harvesting, threshing, polishing by hand). They also make sea salt from sea water collected by some families during their summer vacation trips. The children make “Onigiri” (rice balls) with the handmade sea salt and the harvested rice. These simulated experiences of traditional ways of primary industries contrast with the children’s everyday lives, where the family would buy rice, sea salt, and vegetables at the shops, enhancing an economic system view through their shopping experiences. As part of the ecological systems learning at the Centre, the teachers prepare children’s books and posters appropriate for learning the life cycles of plants and animals, eco-friendly life styles, and environmental issues. Children also attend excursions to the nature conservation park (four times a year for the 5-year-old class, once a year for 3 and 4-year-old classes) and engage in EE programs conducted by outside professionals. The teachers frequently make newsletters for the families and ask them to participate in the Centre’s activities. As the Centre aims to develop child-centered pedagogies, the teachers have always tried to achieve this by promoting children’s talk and interests and using questions to promote children’s thinking and problem solving skills. The teachers continually reflect on their practices and write an annual report from the EE viewpoint at the end of school year. The following three vignettes highlight three examples of ecological learning described by the teachers in the annual reports. Although caring for animals in the classroom is not a usual practice in lower aged classes (children aged 0–2 years), around 70% of Japanese early childhood services do care for small animals such as insects. The Japanese rhinoceros beetle is a large insect and popular with Japanese children (Fig. 1). Nowadays, it is difficult to find wild Japanese rhinoceros beetles in urban areas because of habitat loss. Usually, teachers would buy the larva or adult beetles at the shops and care for them until their death. Teachers of Tomioka-Nishi CECEC tried to find and care for the insect eggs after the adults’ death and made opportunities for the children to learn about its life cycle. Female beetles lay their eggs in the end of summer, the larval stage generally lasts for 8 months, and a beetle develops to an adult in early summer after several weeks of a pupal stage. The larva is around 8 cm at its last stage, and the large larva attracted children; it was easy even for infants to recognize the large larva. The 0-year-old class of Tomioka-Nishi CECEC cared for two Japanese rhinoceros beetle larvae. Officially, the 0-year-old class has children aged from 2 months to 1 year 11 months. Because of their young age, the children could not care for animals by themselves; therefore, the teachers attended to the beetles. The teachers removed large piles of excrement, cleaned the beetles’ case, and regularly moistened the soil with a spray to create a suitable environment for beetle larvae. This daily care work was undertaken on the floor where the children could observe the work closely. Sometimes, the teachers showed the large larvae and invited children to touch them. Children tenderly touched the larvae with their small fingers. Three months later, a larva turned into an adult, and the teachers named it “Kabumaru.” The teachers continued to care for the beetles and the children continued observing. One morning, Osamu (1 year 3 months) came into the classroom. First, he approached a beetle’s case and said “n, n” to one teacher while pointing to the case. The teacher approached him, and they looked into the case together. When the teacher said, “Good morning, Kabumaru,” Osamu said, “n, n” again while looking at the teacher and the case alternately. Then, the teacher asked him, “do you want to see Kabumaru?” Osamu nodded. The teacher put the case on the floor. Other children gathered to see the case, and all looked into it when the teacher opened the lid. Osamu stood up, went to the shelf, and pointed to a spray there. When the teacher asked Osamu, “do you want to give Kabumaru ‘Shu-Shu’?” (onomatopoeia of spraying in Japanese), he nodded eagerly. Then, the teacher took the spray and sprayed water into the case. Osamu touched the bottom of the bottle as if he had helped the teacher. Osamu observed the beetles and the way the water changed the color of the soil in the case. After spraying, Osamu pointed to the direction of the place with the jelly food for the beetles. The teacher asked him again, “do you want to feed Kabumaru?” Osamu nodded with a smile. When the teacher took some jelly food and opened the lid again, Osamu held out his hand. The teacher put the food on his palm. He gently put it on the soil and observed the movement of the beetles. When the teacher took some more jelly food, another child, Daishi (1 year 1 month), also held out his hand. Daishi also put the jelly gently, just like Osamu. They then looked into the case for a while (Onaka et al., 2016). There were plants and small animals in the 1-year-old classroom. A red swamp crawfish named “Momo” had been cared for from when the children were in the 0-year-old classroom, and Momo moved with the children to their new classroom. The children guided a new teacher to Momo’s case and told her its name. The teacher, realizing that the children cared about Momo, put cases of plants and animals on the shelves at the same height as the children. The children also loved to observe the larva of a small white butterfly and called the teacher when its food, “Japanese mustard spinach,” was finished. When the larva turned into a butterfly, the children asked the teacher to set it free while saying “ah, ah” and looking at the window. The children also loved picture books about the animals they cared for. When snail eggs hatched, the children took a picture book and showed a page of snails that were eating leaves to the teacher. Even the children in the 1-year-old class were aware of other animals’ needs. This class started to then care for two Japanese rhinoceros beetles and named them “Chacha” and “Chee” (Fig. 2). One day, the teacher read a children’s book about Japanese rhinoceros beetles. One page showed a picture displaying a beetle taking tree sap from a branch. After reading the book, one boy named Ryota (aged 2 years and 4 months) hurried to the case with the beetles. He looked into the case and the book alternately and said “no, no.” He also approached his teacher and said “no tree” and “no leaf.” Ryota seemed to be aware of the difference between the natural habitat described in the picture book and the case environment in the classroom. When the teacher said, “we had never seen Chacha and Chee fly, had we?” the children showed expressions of deliberation. Then, the teacher asked the children where they could find trees and leaves. The children answered “outside!” The teacher also proposed that the children release the beetles outside, and they agreed (Onaka et al., 2014). One day in July, Hiroki (aged 4 years and 7 months) called the teacher and said, “there are different leaves on the asagao.” The teacher realized it was a small cherry tomato. However, the teacher just answered, “Yes, we saw similar leaves somewhere else, didn’t we?” Although Hiroki started to think about it, he could not get the answer at that time. Several days after, Hiroki called the teacher again and took her to other garden planters where cherry tomatoes were grown. Hiroki said “this leaf is the same!” Then, Hiroki and the teacher picked one leaf from the cherry tomato and went to the boxes of asagao to compare with the leaves of the unknown plant which had leaves that were exactly the same. Hiroki was satisfied with the result. Several days later, Hiroki told the teacher abruptly, “since then I’ve been thinking.” His statement was so abrupt, and the teacher could not understand what Hiroki was talking about, so she responded, “of what?” Hiroki said, “why a cherry tomato came up in the compost soil? We didn’t plant seeds of cherry tomato.” The teacher was surprised to know Hiroki had held his question about the cherry tomato for several days. Although she knew the answer, again, she just answered “yes, we just planted the seeds of the asagao. It is mysterious, isn’t it?” She did so because she wanted Hiroki to find the answer by himself. In September, the children tidied up their vegetable garden after harvesting the summer vegetables. The children completed their gardening role by pulling out old cucumbers, eggplants, green peppers, and cherry tomatoes. The teacher found small fruits on the pulled-out stalks. She picked those small fruits and split them in half. The children looked inside and talked together as follows: “it’s a seed, isn’t it?” “the seed looks like a sesame!” and “we can have green peppers and tomatoes when we plant these seeds!” Then, the children cut and took those stalks to the composts. At that time, Hiroki suddenly said, “I got it! There were tomato seeds in the compost soils, and that is why tomatoes grew there!! I didn’t realize it because a tomato seed was hidden in the soils!” The teacher agreed with Hiroki’s solution by saying “a tomato seed had been ‘sleeping’ in the compost soils, hadn’t it?” Hiroki was excited to have found the answer to his long-held question. Afterwards, he reported this to the other teachers and his mother. When the cherry tomato that was grown with the asagao plants died it was taken back to the compost (Onaka et al., 2016). The children of Tomioka-Nishi CECEC engaged in nature-based activities daily. In these nature-based activities, the children observed animals, plants, and other natural materials. They thought critically, derived questions, sought answers, and felt empathy with the animals. Such activities have been recommended in early childhood education for a long time to contribute to children’s emotional, moral, and cognitive development, as described in the Japanese national curriculum. However, I picked the above three vignettes not because they described the children’s developmental achievements but because they included the processes of learning about ecology. In vignette 1, Osamu cared about the insects and learned that other species also need food and water like humans but in different ways. The understanding of factors to sustain life is the starting point of learning ecology. Food and water are the basic and indispensable factors for all organisms on Earth, including human beings. However, the sort of food and the ways to get food and water differ among species. Osamu also placed the insect jelly “gently” into the caring case. It seems that even a 1-year-old child could feel empathy for other species. Vignette 2 also described how a 2-year-old child could realize the difference between an artificial caring environment and a real habitat. It included two phases. First, Ryota realized that the beetles in the case and the beetles drawn in the picture book were the same animal. Then, Ryota recognized that the two environments (quality of habitat) were quite different. He understood that it was necessary to have trees in the environment for beetles from the book; therefore, he talked about the absence of trees in the artificial case. From his words, he knew that an environment with trees was better for beetles than an artificial case. This implies that Ryota already had developed basic caring values towards living things and the natural environment. The teacher agreed with his thought, shared his thought with other children, and encouraged his finding by releasing the beetles outside. In vignette 3, Hiroki observed young leaves very carefully and recognized the difference between asagao and cherry tomato. In addition, this 4-year-old child had kept his question for 2 months. The knowledge gained through one’s own experiences might have better retention and deeper understanding than the knowledge given as information from adults. A life cycle is an important factor in ecology; therefore, the recognition of a life cycle through experiences might contribute to learning ecology. In this case, the child understood about the life cycle of a cherry tomato: germinating from seed, sprouting, growing, flowering, fruiting, and dying. This cycle requires 1 year. It is easier to understand a life cycle by observing real plants and fruits. However, it might be more difficult for young children to imagine seeds dropping into soils and being dormant for half a year. In this case, the teacher selected familiar vegetables for the garden every year and used the compost soils for planting flowers and vegetables. In addition, the teacher had faith in Hiroki and waited for him to solve the problem by himself. These vignettes show that young children including toddlers can learn the basics of ecology. Even toddlers could understand the necessity of food and appropriate habitat for animals, and care about them. The 4-year-old child could understand a life cycle of a plant. These vignettes could be called traditional nature-based activities (caring for animals and gardening), and we can recognize many aspects of children’s development within these vignettes. However, the teachers practiced these nature-based activities for not only the children’s physical, emotional, moral, and cognitive development, but also for the learning of ecology. The latter will decide whether the activity is a practice of education for sustainability or not. The teachers at the Centre now always create learning environments from the perspective of learning ecology (e.g., compost, selection of children’s books, vegetable garden, and caring for small animals in the classroom) and enhance children’s awareness of the relationship between living things and their environment with their ecological lens. The learning and teaching experiences at the Tomioka-Nishi CECEC demonstrate that it is also important to connect different activities and repeat similar experiences many times from the viewpoint of learning ecology. 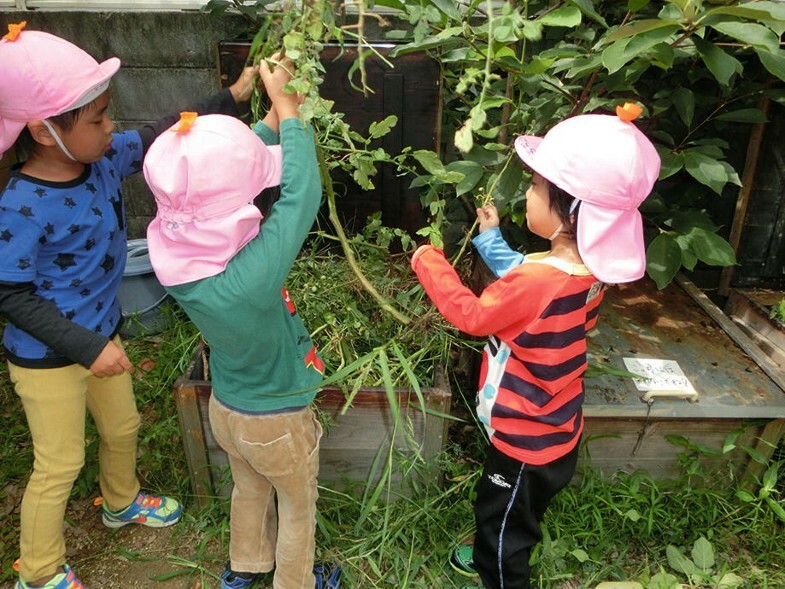 Fostering an ecological lens perspective might be difficult for Japanese early childhood teachers because they have been provided with few opportunities to learn ecology in school themselves. As mentioned previously, although all Japanese students are provided opportunities to learn ecology in schools, the ecology they learn is very basic and superficial. In addition, preservice education for early childhood teachers in training schools (4 years in the university or 2 years in college), which is strictly regulated by the government of Japan, provides various subjects under the national law and regulations. However, most subjects are related to pedagogy, psychology, sociology, or teaching skills. Most training schools do not offer enough opportunities to learn environmental science, EE, and teaching skills for nature-based activities (Inoue, 2008). There are also few opportunities to learn ecology or sustainability in the teachers’ professional development once they are in the workforce (Inoue, 2017). As a result, Japanese early childhood teachers have superficial knowledge of ecology, and this knowledge has limited influence on the teacher’s thinking, beliefs, and teaching; that is, the teachers’ education and professional development rarely support their development of an ecological worldview. Japanese early childhood teachers already have many resources for teaching traditional nature-based activities through professional development, books, and professional magazines. However, I argue that simply using materials or programs of traditional nature-based activities will not foster an ecological worldview. As shown in the vignettes, the teachers with an ecological lens can plan activities with appropriate aims of learning ecology, arrange an appropriate learning environment, and observe children’s words and behaviors from the viewpoint of an ecological worldview. At the early stages in the 8 years of the practice study by Tomioka-Nishi CECEC, the teachers were unable to focus on words and behaviors that indicate children’s awareness or experiences of ecological systems. The teachers just talked about children’s development. Teachers with an ecological lens do not regard animals and plants, which are the components in the Earth’s ecosystem, as teaching resources or materials just for human benefit. When a teacher looks at a leaf through an ecological lens, she/he may find a hole on it and think of what caused the hole or find the tree from which the leaf came and imagine what kind of insects, birds, or other animals will use the fallen leaf or the tree. This extension of concepts through an ecological lens might lead early childhood teachers to reflect on their practices. To foster an ecological lens in early childhood teachers beyond textbook knowledge of ecology, it is necessary to strengthen preservice teacher training curriculum and professional development from the viewpoint of ecology. The vignettes of Tomioka-Nishi CECEC focused on nature-based activities such as caring for small animals, gardening, and outdoor play. Although the vignettes were based on the children’s on-going activities and seemed to be fragmented at a glance, such real activities were not fragmented in the children’s daily lives. For example, the children encountered a variety of organisms, managed compost, and recognized life cycles and food webs through gardening. They were able to observe the same vegetables that grow in their Centre garden being sold in shops, the cost of the vegetables, and the separation of the vegetable wrappings or waste from vegetables from the Earth’s ecosystem in contrast to their composting of scraps. They were also able to consider how and who produced and transported the vegetables in the shops. Through these experiences, the children learned how economic and social events are also related to the natural world. So the children’s various experiences in their everyday lives could be connected and integrated as a whole to foster an ecological worldview. In the late twentieth century, EE/ESD/EfS emerged as a new educational field in response to the environmental crises of the Anthropocene. Furthermore, in recent years, such forms of education are recommended to start from early childhood (Davis & Elliott, 2014). Although the role of ecology has always been described as one element of sustainability concepts, ecological systems thinking or ecological worldviews have not been identified as a high-priority topic in education. However, a sustainable society is actualized only on the basis of ecological worldviews, not of economic worldviews (Krebs, 2008; Schmitz, 2016). Therefore, the proponents of EE/ESD/EfS have recognized the importance of nature-based activities such as gardening, caring for animals, or playing in outdoor nature spaces to promote ecological worldviews. However, for example in Japan, such traditional nature-based activities already have been included in formal early education for a long time (since the nineteenth century), and their aims and objectives have focused on children’s development per se, and not on the development of ecological systems thinking or ecological worldviews that might contribute to addressing sustainability concerns. 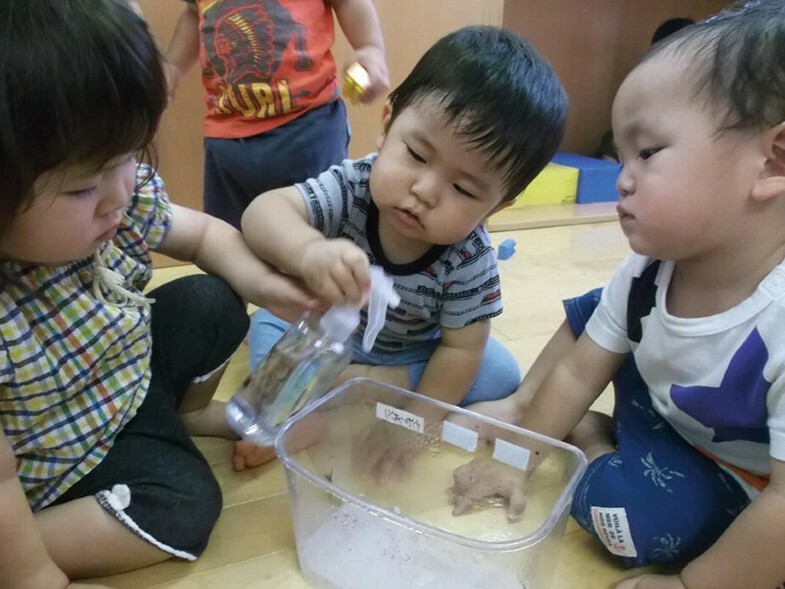 The vignettes from a Japanese early childhood center illustrate that even children at the earliest stages of their lives have the potential to learn ecology and that it is possible to foster an ecological worldview in very young children. I propose that learning from traditional primary industry practices or indigenous cultures might contribute to fostering ecological worldviews; however, the teachers’ role in this is most important. As the Japanese vignettes presented in this chapter show, those teachers with an “ecological lens” can rethink existing nature-based activities to foster learning about ecology. In Japanese early childhood education, theorists and practitioners recognize that the quality of the learning environment is extremely important for children’s development. However, for many teachers, the natural world is just a material or an educational resource. This paradigm is homogeneous with a worldview that the natural world exists for the use of human beings and contradicts the childhoodnature perspective that is central to this handbook. Education in this paradigm reproduces people whose economic worldviews place value mainly on their own selves. However, the health of the natural world is the most fundamental and essential factor for sustainability where humans are recognized as nature and thus interconnected with nonhuman nature, as represented by childhoodnature. Therefore, a paradigm shift from education based on the economic worldview to education based on the ecological worldview is necessary for sustainability. This signals a new role for nature-based activities in education, including early education. Education remains one of the important strategies for building a sustainable society, as Dewey (1916) aptly summarizes in the following: “In directing the activities of the young, society determines its own future in determining that of the young” (p. 48). This research was partially supported by JSPS KAKENHI Grant Number 15K00668 and Special Research Grant of Osaka Ohtani University, Japan. Ritchie, H., & Roser, M. (2017). Fossil fuels. Published online at OurWorldInData.org. Retrieved from https://ourworldindata.org/fossil-fuels. [Online Resource].